What a grand sight it is to see and hear this beautiful bird, especially in flight. It is spring here in Wyoming and these birds are passing through on their way north. A few will stay and raise young in the area but the majority will continue northward. We have had several pairs spend the winter allowing me a number of cold mornings of photography sitting under a blind. They are wary birds and it took time and patience to approach the pond and give the swans time to relax and move within camera distance. This particular morning it was cold and the frost was still visible on the birds feathers. Unlike myself, they had no concerns over the sub-zero temperature. I watched them awaken and toss water over their heads to rid their feathers of the frost crystals. The water literally rolled off their backs just like a duck!! The reality of the warmth of their feathering really hit home. 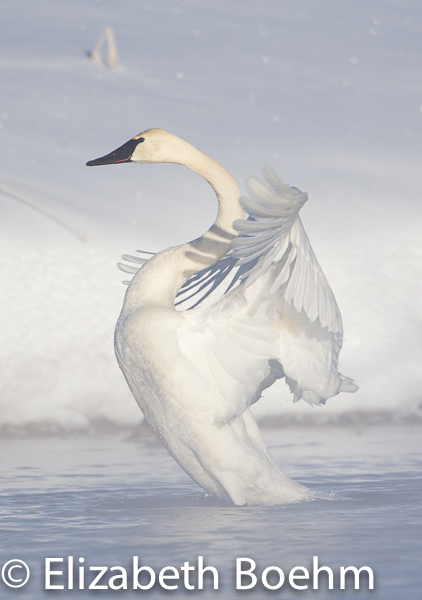 The Trumpeter Swan is a large, white bird that was at one time headed for extinction. It’s numbers have now increased but it is still easily disturbed at it’s nesting sight. It lives along waterways, lakes, and in marshes eating submerged vegetation. 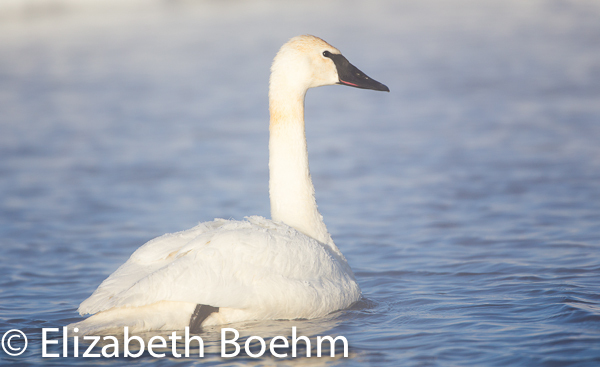 The call of this swan is described as a “ko-hoh” which can easily distinguish it from a Tundra Swan, a much smaller waterfowl that typically has a yellow spot on it’s upper mandible. Both can be seen during the migratory season in Wyoming thus it is always good to take a second look. 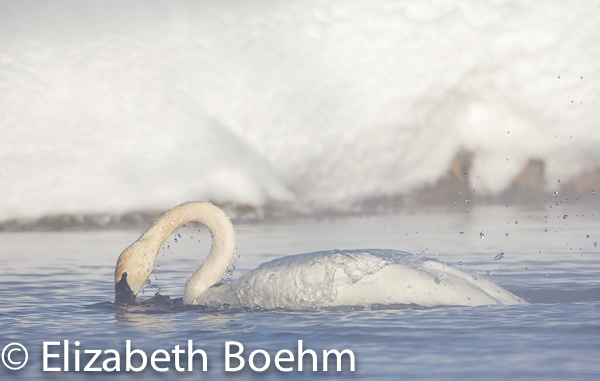 The Trumpeter Swan can often be heard calling in flight and I thoroughly enjoy seeing a family group winging by on a cold, winter/spring day!